New Zealand Ice Cream is currently having a Go Green Recycling Promo at all outlets except KL Convention Center. To discourage the use of environmentally unfriendly plastic bags & foam boxes, New Zealand Natural has introduced their own Ice Cream Cooler Bags! To encourage customers to use these bags, cash rebates on Ice Cream Take Home Packs are given to customers who present these Cooler Bags during their purchase. On top of that, New Zealand Natural has introduced “Book Crossing – Drop & Pick Up a Book” at selected stores, to encourage the public to send in their pre-loved books and swap it with a book on the shelves. Share a good read with others, reduce the number of printed books in circulation, and save money all at the same time! So instead of throwing out your old books – put them to good use. 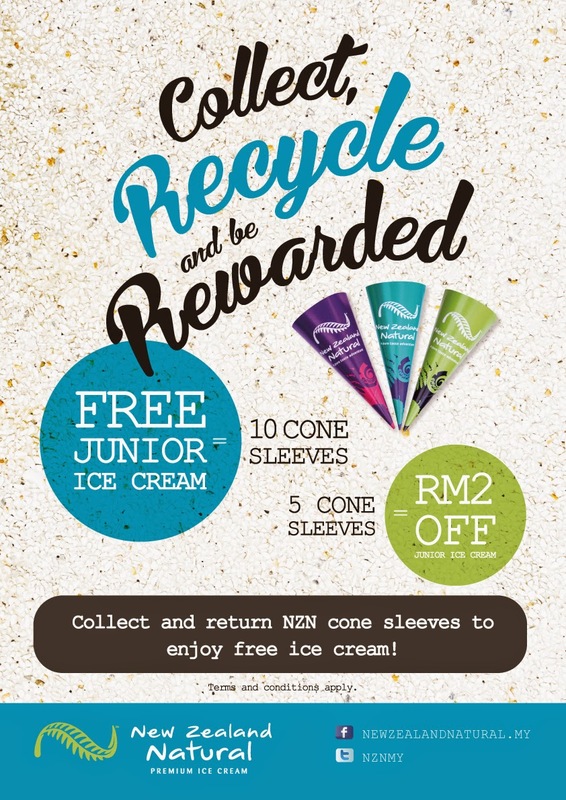 In the month of October, New Zealand Natural is rewarding those who return New Zealand Natural cone sleeves to their stores.Enjoy RM2.00 off a Junior ice cream or receive a FREE* Junior ice cream depending on the quantity of cone sleeves returned. So what are you waiting for! Grab yours today at all participating outlets except KL Convention Center! For more information, do log on to https://www.facebook.com/NewZealandNatural.MY?ref=br_tf.